Asdee overcame Moyvane in a cracking game on Saturday last in the Junior Football Club Championship on a final score of Moyvane 1-11, Asdee 4-6. Down a number of players through injury, Asdee showed fantastic spirit with the young lads coming in doing themselves proud. Within the opening 3 minutes, Moyvane had 2 points on the scoreboard from Shane and Martin Stack. A Paul O’ Carroll free and a great point from cornerback Con Carmody leveled the score in the 7th minute. The teams remained evenly matched until in the 10th minute when Donie Stack put the home side on top once again. Asdee then lost Eoin Kennedy through injury, seeing Keith McNamara return to the senior fold after a year out. Paul O’ Carroll freed for Asdee coming to the end of the first quarter and although both sides had chances the next score did not come until the 23rd minute when the first goal of the game was brilliantly taken by Asdee’s Cyrill Dineen. This seemed to rally the home side and 2 unanswered points from Martin Stack followed by a goal from Ciaran Ahern put Moyvane 2 points in front on the 30th minute. The teams exchanged points in added time a lovely point from Paul O’ Carroll and Shane Stack from distance to leave a half time score of Moyvane 1-6, Asdee 1-4. Asdee had the perfect start to the second half with Shea Doran hitting the back of the Moyvane net in the opening minute for his first senior goal. 3 points from the home side scored by Shane Quinn and 2 from Martin Stack saw the score 1-9 to 2-4 in favour of Moyvane on the 45th minute. Darren Russell, who played a hugely influential role, brought the gap to a minimum with a long-range point following an excellent team move. Martin Stack again put the home side 2 points ahead in the 45th minute. Cyrill Dineen pointed before Darragh Keane finished a rocket of a shot to the roof of the net after an outstanding move seeing Asdee go from their own end line to put the visitors 2 ahead in the final minutes. Martin Stack again pointed for Moyvane leaving just 1 point between the teams in the closing stages. Asdee defended valiantly to force a number of turnovers before Moyvane gave one last effort to draw the game. However, a crucial turnover by Martin Collins saw Asdee breakaway, again working it well down the field before a dangerous ball by Kieran Kelly into the area was beautifully finished to the net by Stephen Lynch for his first senior goal. Leaving the full time score Moyvane 1-11, Asdee 4-6. The character shown by Asdee’s players to get the result was exemplary, each man gave their all and it made for a thoroughly enjoyable game of football. They were a credit to themselves on a day when they were certainly underdogs, missing 6 of their more senior players. 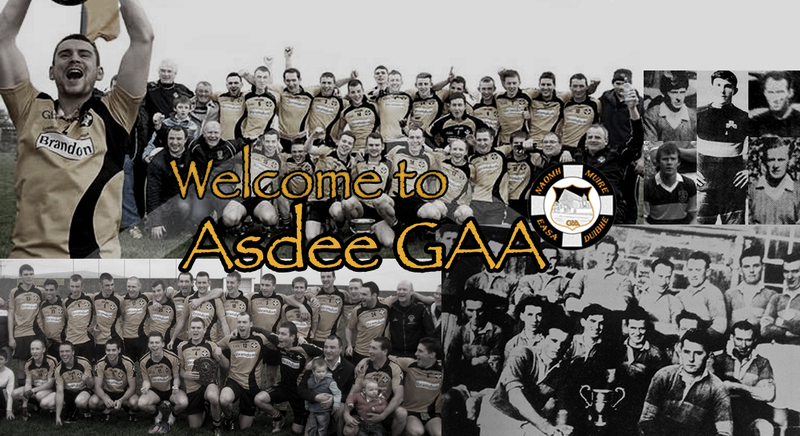 Asdee Team: James Kelly, Con Carmody (1pt), Martin Collins, Jack Collins, Jack Keane, John Doran, David O’Connor, Mike Breen, Kieran Kelly, Paul O’Carroll (3pts), Darragh Keane (1gl), Darren Russell (1pt), Shea Doran (1gl), Cyril Dineen (1-1), Eoin Kennedy. Subs: Keith McNamara for E. Kennedy, Stephen Lynch (1gl) for K. McNamara, Conor Keane for S. Doran. Moyvane: D. Fitzmaurice, E Mulvihill, J Finucane, DJ Keane, G Mulvihill, E Stack, S Carmody, E Flaherty, S Stack, S Leahy, G Clancy, L Greaney, C Ahern, M Stack, D Stack. Asdee GAA’s third and final Stars in Their Eyes will be held on the May Bank Holiday weekend, Sunday, May 5th in the Asdee Community Centre. The final couple of acts are being put in place as we speak, with a number of new acts penciled in to perform in what promises to be a great night’s entertainment. We will have more details for you in the coming weeks as tickets go on sale. GOLDEN GOAL Weekwinners in our Fundraisers”Golden Goal” were; Caoimhe O Hanlon, Tralee and Sean Fitzgerald, Tralee who will each receive E40 to be given out each week to the winning number that corresponds with the first goal scored. FIXTURES. Kerry Petroleum Junior Club Championship Asdee are in Group 2 along with Beale, Moyvane and Reenard. Next up will be a date with our near neighbours Beale on the weekend of April 13t/14th. County Minor League Division 3 “B”, at O Rahilly Park, Ballylongford, Friday April, 5th, 6 45pm. Asdee/Ballylongford/Ballydonoghue v Glenflesk. McCarthys Insurance Brokers Senior Football League Division 2 Semi Final; Asdee v Duagh. Sunday May 19th. Venue and time to be confirmed. Next County League Division 5 fixture will be a home game against Rathmore on Sat/Sun. May 11/12th.